Our miscellanous section includes our Pot Saucer which can can be sued to stand larger church candles on. 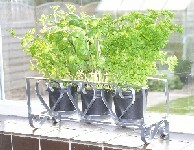 However, it is equally useful as Plant Pot saucer to help plants retain moisture as shown in the Herb Planter below. These items can sit in rings or bent metalwork created won our RBR tools or XL5+ Power Bender .